I'm pretty sure that the most lived in room of our house is our bedroom. We live in a small 1400 square foot house, with a fairly large master bedroom. And so, this has become the bedroom/family room for the Hubs and I.
so our tv is tucked away in the armoire in our bedroom. Grandkids over for a visit and want to watch a movie? Pile up on Papa and Nana's bed, (the aftermath as seen above), and enjoy! Our room probably gets the best light in the house. it's reminiscent of the beach cottage I've always wanted. 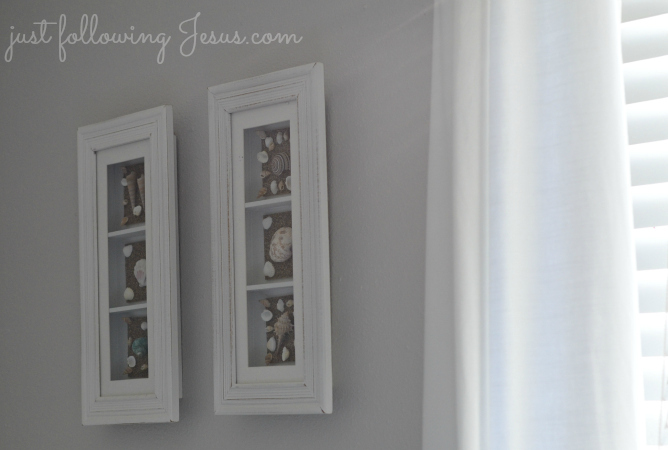 A little bit of beach shell art goes with my beach cottage wanna be room. 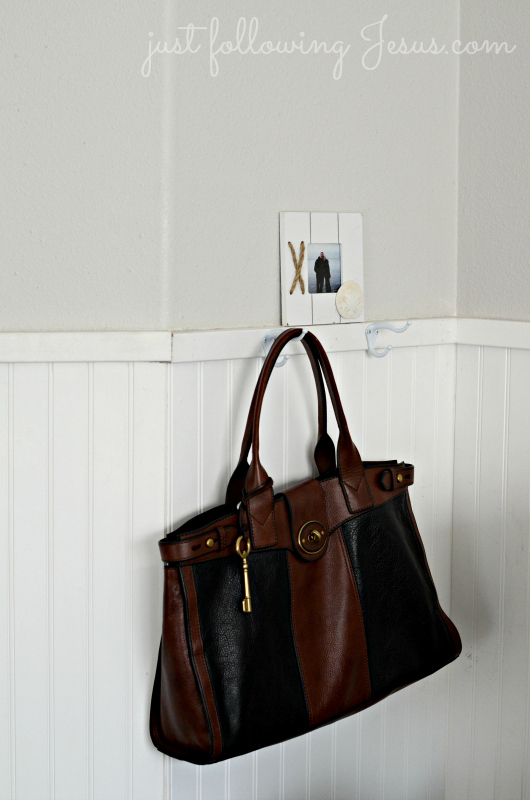 Hello, smartest and easiest solution to where do I keep my handbag! our nightstands that are always loaded with books and such. How do people keep their nightstands perfectly styled with only a few well chosen trinkets on them? ready for me to work out on days when it's too rainy to run outdoors. giving the illusion that our homes are always clean, neat and decorated like a magazine! Not in this well loved, well lived in room! It's tempting to only show the pretty isn't it? But the real life stuff...the over flowing nightstands...that's life. And it has it's own particular kind of beauty I think. It's kind of like our lives, isn't it? We show the pretty outside trying to make it always look good, and not the sometimes disheveled inside. Anyway, your bedroom looks like a comfy place to hangout. One day when my husband retires we will have a light and airy bedroom. No more dark walls, etc, for sleeping in the day. I love yours. I love the grey paint, Elizabeth. I've been wondering if we should make the switch, from LR to our bedroom with the TV. Our master bedroom is twice as large as our living room, and it might be more practical with grands, as you mentioned. But every summer I host a women's Bible study, and I wonder how they'd all like sitting in our bedroom! :) Really don't want to get two TVs. I enjoy the peeks into your life/house/journal...God bless you! Thank you for giving us a peek at your lovely bedroom. I love the calm colours and the sea shells. My bedside unit starts off being orderly but like yours soon progresses to piles of books just being read or waiting to be read. I love your room. 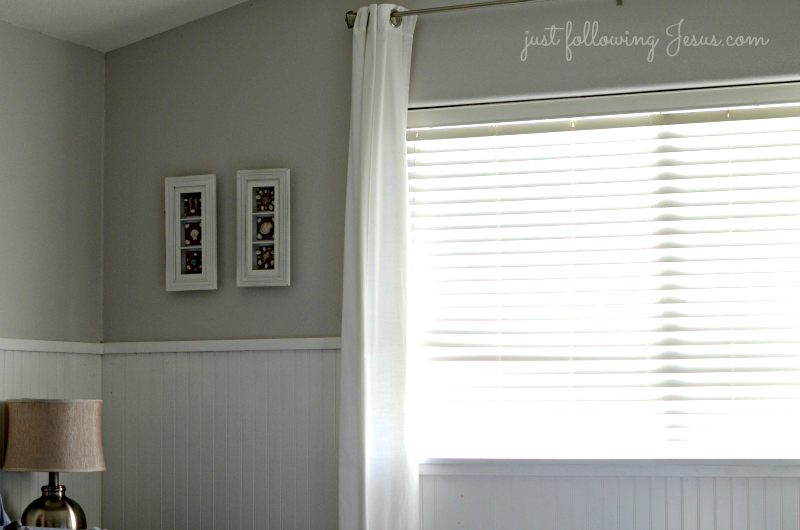 I'm such a big fan of beadboard, and that room just looks peaceful to me with it. Praying for you, friend, as you make this hard decision! Beautiful lived in room. 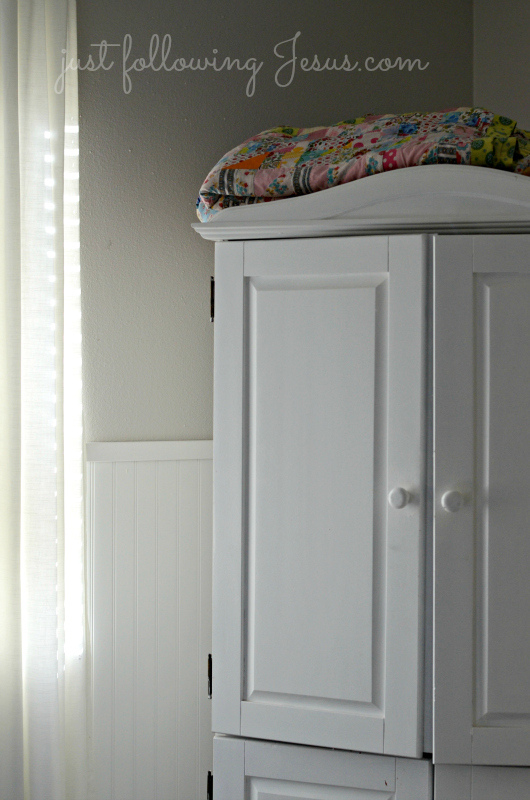 Love the pop of color on top of your armoire. Hi Elizabeth, Love your room, and that it is the most used room! The colors are so soothing and lovely. And the bead board looks wonderful! And yes, there is much we don't show in blogland or regular life. 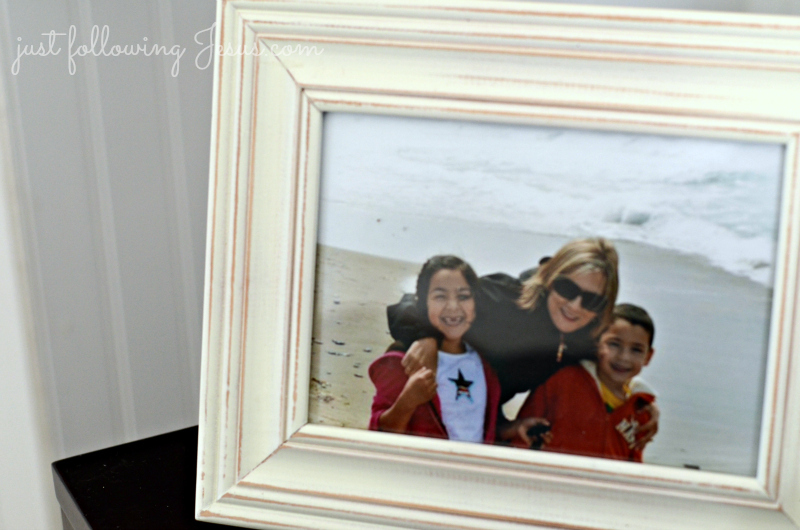 I know I always want my home tidied up when we have any guests over! Thanks for sharing at Blissful White Wednesday!